Black, red, cream and gold are the colours that define Phyllida Lloyd’s Royal Opera House staging of Verdi’s robust, yet penetrating setting of Shakespeare’s Scottish play. Manipulated by a whole coven of cunning, scarlet-turbanned witches, the characters often evoke figures in a splendid Gothic fresco. 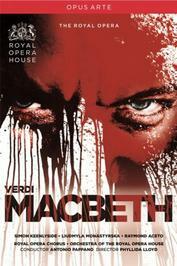 With Simon Keenlyside making his British debut (as an athletic, brooding Macbeth), and Liudmyla Monastyrska as his Lady, both imperious and subtle, this performance, masterfully conducted by Antonio Pappano, goes far beyond mere sound and fury. This production went out LIVE to cinema screens around the world.